The Ontario Centres of Excellence (OCE) has teamed up with the StartupNorth team to present a special DemoCamp on May 19th at 3:30pm at the Toronto Metro Convention Centre as part of the Discovery 11 conference. It is a chance to put DemoCamp in front of a different audience, drawing all the Discovery attendees. In 2010 we had a standing room only crowd. We have space for 300+ this year. Discovery is the annual showcase of the best of innovations in Ontario hosted by OCE. 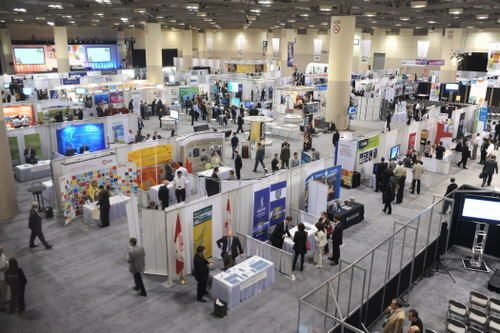 Recently named Canada’s Best Trade Show 2010, Discovery has become the premier innovation and commercialization showcase in Canada with over 2500 attendees & over 300 exhibitors. A hot panel on the direction of mobile app development in Canada, moderated by Kunal Gupta, CEO and Founder of Polar Mobile. The return of the Elevator Pitch competition – Dejero Labs and Gridcentric were past award winners. We are looking for up to 5 startups or entrepreneurs to demo a new technology. Selected presenters get 5 minutes to show us the best of their application and then ask the audience for feedback, coaching, and insight from a highly connected, if occasionally cynical, crowd. You get market advice, technology advice, and pitch advice and the opportunity to deal with the hecklers. Want join the audience, offer advice, heckle and get to explore the full conference floor? Discovery is a full conference and trade show at the MTCC with all the typical costs and overheads. We run it on a cost recovery basis with a lot of very generous help from sponsors, but costs are a lot more than your typical Democamp.